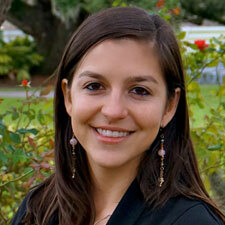 Ximena was born in Colombia and immigrated with her family to the United States at an early age. Growing up, she witnessed her parents develop a successful family business from the ground up as a means for financial self-sufficiency. Her family’s path to citizenship through entrepreneurship has inspire her to work with many immigrant entrepreneurs as well as other self-employed people who end up in entrepreneurship due to barriers to employment. Upon completing her master’s degree in International Business, Ximena moved to the Bay Area to participate in the burgeoning field of small business economic development. She has worked with several organizations that have made an impact in the Latino immigrant community, including Women’s Initiative and Mission Asset Fund. In 2015, Ximena launched her own consulting business and has been working with non-profit organizations as well as entrepreneurs across the country in program and service development. Through her consulting business she has worked with Immigrants Rising (formerly known as E4FC), Prospera and the San Francisco LGBT Community Center. 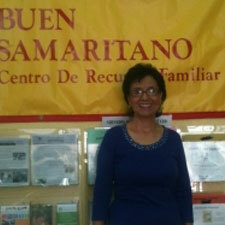 Ximena is thrilled to be on the board of Good Samaritan to further its mission and commitment to immigrant families. Bao-Tran Ausman came to the United States with her immediate family in 1980 as a refugee from Vietnam. When they arrived, they did not understand English and had no money. Her parents applied for welfare, enrolled in English as a Second Language courses in the evenings, and then went to college to earn their degrees. During their first few years here, she and her family benefited tremendously from services provided by charitable organizations similar to Good Samaritan that helped them establish themselves and thrive in their newly adopted country. 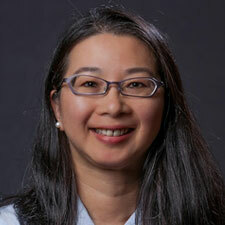 Bao-Tran went on to earn her undergraduate and graduate degrees from U.C. Berkeley. To give back to the low-income and immigrant community, she has dedicated her career to the development and financing of affordable housing. She is also a parent with young children. She is interested in issues of affordable housing, immigration, education, and quality childcare in San Francisco. Rev. Dr. Joseph Bryant, Jr.
Rev. Dr. Joseph Bryant, Jr. leads Calvary Hill Community Church, a 1,500 member congregation in the Bayview district. Also the National Director of Sports and Co-Director of PUSHTECH 2020 for the Rainbow/PUSH Coalition, he is a Good Samaritan Board Member. Pastor Bryant has been a central figure in the development of the Vision Academy, Good Samaritan’s popular and acclaimed out-of-school-time program that brings chess, computer coding, mentoring and more to 75 children daily. Rosalyn Chen immigrated from Taiwan to California with her family at the age of 11 not knowing a word of English. Times were tough for her family as they struggled to make a life in this new country. Through much hard work, family sacrifice and support, she received her BA in Political Science from UC San Diego and her MBA in finance from the University of Southern California. She spent 10 years working as an investment banker at UBS Investment Bank and Piper Jaffray helping government agencies secure funding for infrastructures such as schools, roads, police stations and water/wastewater facilities. Chair of the board’s development committee, she is proud to bring her immigrant experience and financial expertise to Good Samaritan. Robert Cornwell helped develop Good Samaritan’s Family Resource Center building in the Mission. He also negotiated Good Samaritan’s partnership with Mission Housing Development Corporation, which created 20 units of very low income housing on the Family Resource Center site. As President and Principal of CSG Advisors, Bob structured over $11 billion of transactions to support affordable housing, redevelopment, education and infrastructure projects around the United States. 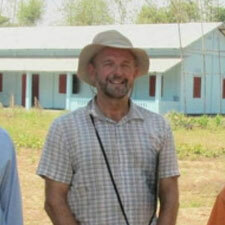 In 2010 he founded Build a School in Burma. The nonprofit organization has completed 6 schools in that country and has more under development. Bob was previously Director of Financial Management for the City of Denver, a US Peace Corps Volunteer in Jamaica and a Forest Service wilderness range in Colorado. Frank DeRosa is President of the Good Samaritan Board; he has been a board member for 30 years. He remains committed to Good Sam’s mission to assist immigrants in becoming contributing members to the Bay Area community because his four grandparents immigrated through Ellis Island two generations earlier. He is the beneficiary of their American dream. When not at Good Samaritan, Frank is a developer of renewable energy power plants. He is the founder and former CEO of an independent solar energy development company, and led PG&E’s renewable energy program. 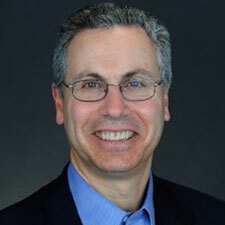 Frank is a recognized industry expert in state and federal energy policy, with testimony before Congress and State authorities on energy policy, facilities siting, and electricity regulation. Vidya Drego is a second-generation immigrant whose family hails from India. Although she’s lucky to have had a strong network of family and friends that helped her to succeed, she’s well aware of the hard work and sacrifice it takes to be successful in a new country or to rise from challenging circumstances. Her commitment to helping people of all backgrounds obtain access to opportunity through education is what led her to Good Samaritan and she’s excited to be joining the board as of March 2019. 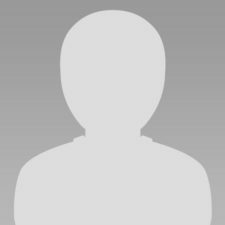 Vidya is currently a marketing leader at LinkedIn, a company also aligned with a similar mission, and has a BS from Stanford University and an MS from MIT. When she’s not working, Vidya and her husband, Nigel, also a first-generation immigrant, are busy chasing after their twin toddlers! Bob Hernandez is a native San Franciscan and the son of immigrants from Nicaragua. 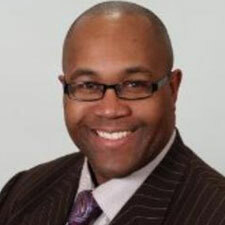 He attended Lowell High School and graduated with honors from City College of San Francisco, San Francisco State University, and the University of California Berkeley where he received his Master in Social Work. Bob is a passionate leader and has dedicated his life to improve the lives of Latino children, youth and families in San Francisco. Retired, Bob served as a clinical social worker in San Francisco’s Department of Public Health for more than twenty years providing leadership in the Children Services and Behavioral Health Division. Bob currently serves as the President of Mission Council Board of Directors and is the founding board member of the Cesar Chavez Parade and Recognition Council. Bob has received many recognitions for his contributions among them, a Certificate of Recognition from the San Francisco Board of Supervisors for Outstanding services to the Spanish Speaking Community of San Francisco, Certificate of Appreciation from the San Francisco Education Fund for San Francisco Public Schools and Coleman Advocates for Children and Youth and Families. He also received an award from the Department of Human Services for improving services to the Latino community and earned a Lifetime Achievement and Community Service award from the National Latino Peace Officers Association-SF Chapter. 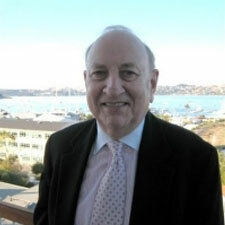 Alan Levinson is a long-time Good Samaritan board member. He has a B.A. in business from Arizona State University and an M.A. in Hebrew Letters from the Hebrew Union College. An ordained rabbi, he has been a tireless advocate for immigrants and people of color since the mid-sixties. As a nonprofit activist, he has worked as a volunteer in San Francisco who assisted thousands of immigrants transition into the workplace. For several decades Alan worked as an Executive for the San Francisco Jewish Community Center and then at Northern California Grantmakers where he was the Program Executive in charge of Emergency Loans and Grants. 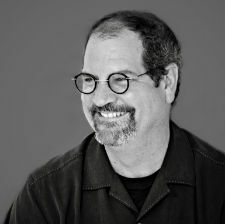 He worked with the San Francisco Foundation, Apple, Marin Community Foundation, Levi Strauss, Chevron, Apple, and the Walter and Elise Haas Fund. Vangie Lopez is a product of the Mission District of San Francisco, where Good Samaritan is headquartered. Her parents migrated from Mexico to the United States, looking for a better life for their children. Vangie is a Spanish-speaking trainer and facilitator who coaches low-income women in starting their own small-businesses; Vangie has even travelled to Santiago, Chile to conduct a program. Through her company, Heart @ Work, she works with non-profits as a mentor and coach, and she is a Diversity and Leadership consultant. 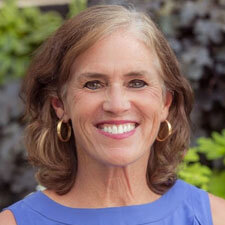 She is President Emeritus of Good Samaritan’s Board and chair of Good Samaritan board’s Human Resources Committee. Also, her family has ties to Good Samaritan; her mother-in-law took piano lessons at Good Samaritan as a child! Vangie and her husband Mike volunteer as homeless shelter cooks and servers, visiting the homebound, and singing in church choirs. They also enjoy traveling to Hawaii to visit their daughter and grandchild. 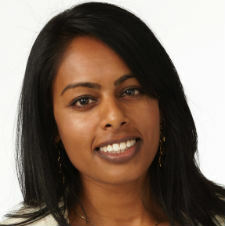 Virginia Slutu was born in Moldova, and became a naturalized French citizen before moving to San Francisco with her husband Rishab, who has roots in India and The Netherlands. 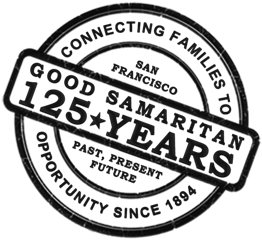 Virginia and her husband are both dedicated to Good Samaritan’s cause of supporting immigrant families in underserved communities in San Francisco. They are also supporters of child care and education services in Moldova and India. 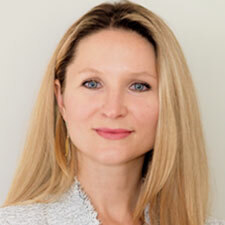 Professionally, Virginia is an attorney and founder of LEGALSV, a San Francisco-based law firm. She is humbled to be able to contribute her personal and professional experience to further the Good Samaritan Family Resource Center’s mission. Rebecca Susser was raised in San Antonio, Texas where the large Latin community was an integral part of her experience and upbringing. Her grandfather and great grandparents immigrated to the United States in the early part of the 1900’s fleeing persecution and seeking greater opportunities in the United States. Rebecca attended the University of Texas in Austin with a major in Plan II Honors and then received her MBA at the University of Pennsylvania Wharton School. She worked in the management consulting industry and brand management at the Clorox Company for fifteen years. For the last decade, Rebecca has devoted her time to family and volunteer work. She coheads the volunteer food pantry corps at Jewish Family and Children’s Services, volunteers at her children’s schools, and was Co-President of The Reading Tree, which merged with Good Samaritan in 2018. Rebecca’s involvement with Good Samaritan originated when both organizations decided, many years ago, that The Reading Tree would send bilingual literacy experts to teach FREE weekly literacy and language acquisition classes to families with children 0-36 months. This “Growing with Books” program continues to this day. Rebecca is proud that her board membership at Good Samaritan allows her to continue to bring reading and literacy to immigrant families. Kat Taylor is President Emeritus of Good Samaritan’s Board. Active in a variety of social enterprises, public benefit and philanthropic ventures on the West Coast, she works in service of restoring social justice and environmental well-being. Kat is Co-Founder and Co-CEO of Beneficial State Bank, a Community Development Financial Institution (CDFI) whose mission is to bring beneficial banking to low-income communities in an economically and environmentally sustainable manner. The bank’s revolutionary ownership mandates that any distributed profit be invested in the low-income communities it serves and environment upon which we all depend. Kat is also a Founding Director of TomKat Ranch Educational Foundation (TKREF), dedicated to inspiring a sustainable food system through ranching, training, tours, research, and school food and garden programs. TKREF owns the social enterprise LeftCoast GrassFed, raising humanely cattle and other livestock for the benefit of people and the planet. 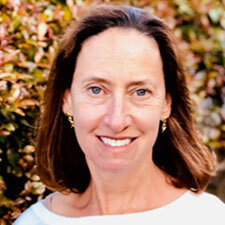 Kat serves and has served on many non-profit boards including the Harvard Board of Overseers, Ecotrust, ProPublica, CuriOdyssey, Insight Prison Project, KQED and Yerba Buena Center for the Arts. She graduated from Harvard College and earned a JD/MBA from Stanford University. Tom Steyer, Kat’s climate/energy activist husband, and she have four grown children, each pursuing their own wild and precious life. Douglas’s commitment to design excellence extends throughout his practice. He is equally adept sketching design solutions in the studio and discussing the best way to approach a construction detail with a veteran craftsman. This deep understanding of all aspects of design and construction makes him a valuable designer, leader and teacher. Whether working with clients or jointly leading the San Francisco studio, Douglas is a “hands-on” collaborator. Clients say that he transforms their ideas and aspirations into built form – combining creativity in exploring design options with an understanding of how they must respond to the uniqueness of context. Colleagues are inspired and motivated by his dedication to great design. 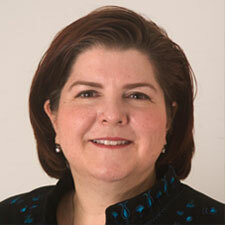 Mary L. Vargas is founder of Achieve Consulting Group. An organization effectiveness expert, Mary has an unwavering belief that by building on strength, teams and organizations can overcome thorny issues, imagine and create vibrant futures, deal with tough situations and decisions, and be stronger for the process. Mary lives in San Francisco with her husband, Jose. Sandra Vivanco is the product of a Peruvian and Colombian fusion. 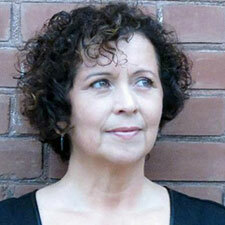 She moved to San Francisco in the early 1980s to complete her undergraduate work at UC Berkeley. She later graduated with honors from Columbia University’s Graduate School of Architecture, Planning and Preservation. Sandra has practiced architecture in Japan, Portugal, Italy and Brazil; she has also taught at Barnard, Columbia, UC Berkeley, California College of the Arts, Escola da Cidade in São Paulo, and Universidad Ricardo Palma in Lima. In addition to leading the San Francisco based firm, A+D (Architecture+Design), Sandra is an Associate Professor of Architecture and Chair of Diversity Studies at California College of the Arts. While A+D is better known for its public works in communities of color, several residential projects are featured in two recent books: San Francisco Modern Homes and Casas en la Ciudad, Architectural Houses. Sandra was selected as one of 10 Architects to Watch featured in California Home & Design magazine in 2010. Sandra Vivanco is author to several articles on Latin American 20th century architecture, specifically the post war condition in Brazil – including chapters on Transculturation; Cities, Spaces and Architectures in Latin America; and Baroque New Worlds. 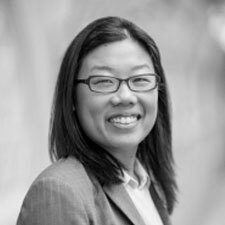 Charmaine Yu is an attorney at Coblentz, Patch, Duffy & Bass LLP, representing Bay Area individuals and entities in complex commercial litigation in state and federal courts across the county. Previously, Charmaine was a deputy public defender in San Francisco who worked closely with many members of San Francisco’s immigrant community. During her tenure as a public defender, she learned that meeting the needs of children and families was an important factor in helping San Francisco thrive. That experience led her to join Good Samaritan Family Resource Center’s Board of Directors in 2013. 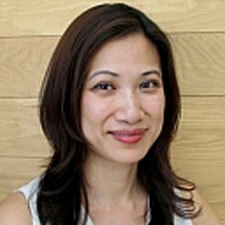 Charmaine lives in the Potrero Hill neighborhood of San Francisco with her husband. When they’re not here, they prefer to be traveling in Central and South America.